Anita Amponsah has been operating Assurance Home Daycare since her youngest child was born five years ago. Motivated by providing the same level of tender care to other children that she would want for her own child, Ms. Amponsah aims to create an environment for her families that feels like a home away from home. Ms. Amponsah operates her childcare with the support of her husband, who is an active-duty member of the Navy. 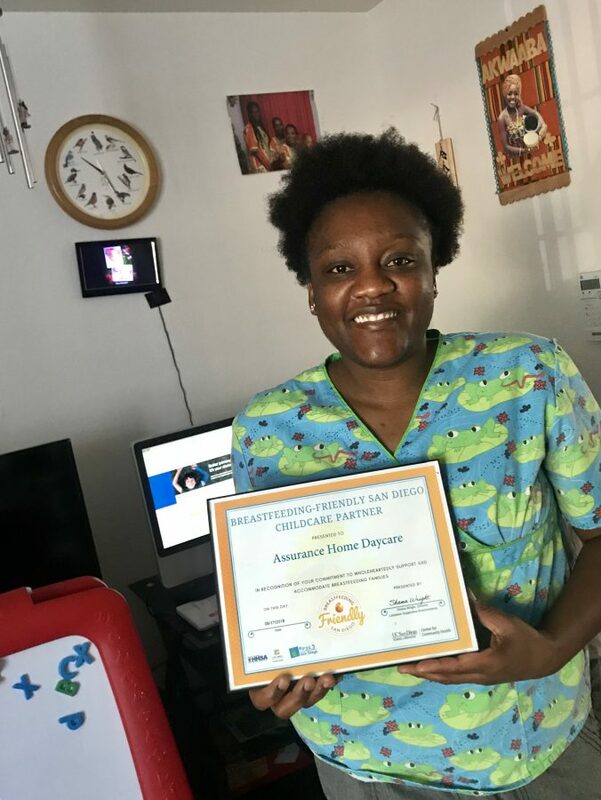 Ms. Amponsah joined the Breastfeeding-Friendly San Diego (BFSD) program as way of offering additional support for her families after she noticed that several mothers were requesting to breastfeed on-site. The BFSD program supported Ms. Amponsah in creating a breastfeeding space by providing recommendations and a partition screen. Ms. Amponsah recommends the BFSD program to other childcare because she feels it shows parents that a provider is really breastfeeding-friendly. Congratulations Anita Amponsah on becoming a recognized BFSD provider! For program funding information, please see Breastfeeding-Friendly San Diego.